Xian was one of the many places on my “Gotta Visit” list. 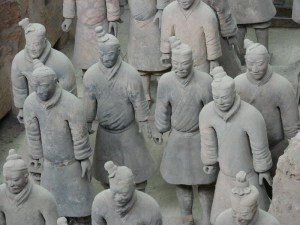 I visited the Terra Cotta Warrior Expo in Toronto three years ago but even before that I was intrigued by the warriors. This year we included Xian on the China portion of our trip. We flew to Xian from Chengdu. The flights in China are reasonable and serve food. We booked the Mercure Hotel on Renmin Square and were upgraded to the Grand Mercure just steps away. Renmin Square turned out to be a sea of tranquility in a city the size of NYC. The Mercure hotels are part of the Accor family of hotels and their high-end property, the beautiful Sofitel, was across the square and we could use their facilities. The square had plenty of trees and a tree guide that pleased John as he checked out all the ginko trees. We found a taxi driver who spoke fairly good English so we took her card and called her whenever we wanted to go somewhere. The taxis in China are inexpensive and they always used the meter. There is basically no tipping in China. She drove us to the Terra Cotta site which was about 30-minutes from the city center and we were glad we did not take a group tour because we were able to take our time. We hired an on-site English guide but everything was well-marked with English explanations so he wasn’t really necessary. 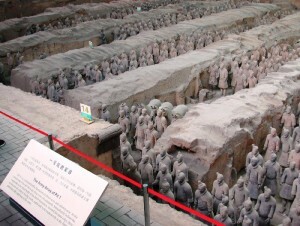 The sight of thousands of life-size terra cotta warriors in formation does not disappoint. 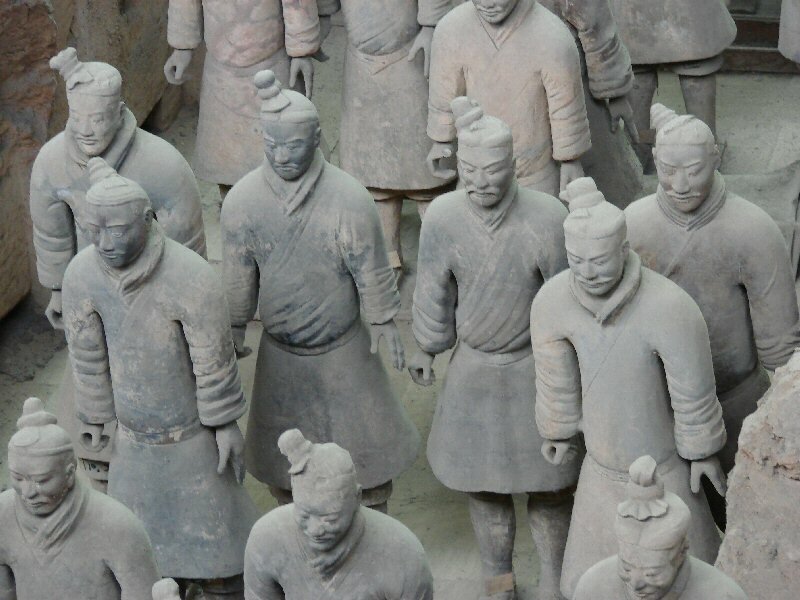 It is all part of the tomb of Qin Shi Huang who, 2,220 years ago, united the various areas of China and named himself First Emperor of China. Each warrior is different and exquisitely made. We could see individual strands of hair and veins in the hands. Only three excavated pits are open to the public and the emperor’s mausoleum has not been excavated. According to historians of the time, the burial mound which is about a mile from the pits, contained 100 rivers of flowing mercury under a ceiling decorated with celestial bodies. It took 700,000 workers several decades to complete the massive funerary that was not discovered until 1974. Another day we visited the Muslim quarter of the city which is a fascinating area with exotic food, a bazaar, and the Great Mosque. The taxi driver dropped us at the end of a pedestrian walkway. I had trouble finding the mosque because I was looking for a dome and minarets. 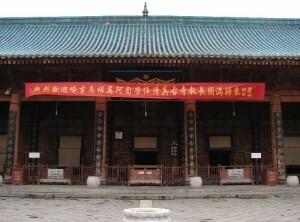 The Great Mosque is Chinese in style with some Arabic lettering and decoration. It was built in 742 AD. I was surprised that they had such a large Muslim population but in the 8th century AD Xian was the largest city in the world with a population of two million, one third of them foreigners. 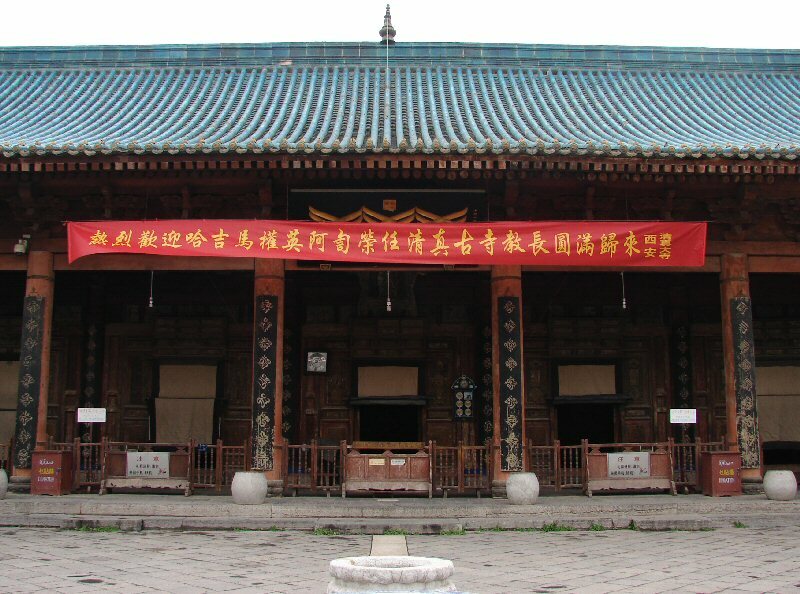 And, as the start of the Silk Road it brought people from all over Asia and the Middle East to Xian. Not far from the Muslim Quarter is the Drum and Bell Tower and a little further on the main gate to the walled city. It was a great walking tour. The amount of building going on in Xian defies description. Everywhere there are high rise buildings going up and in residential areas they are being built in groups of 10 or so with a park separating them.